Tuvalu and Kiribati: Should they stay or should they go? Migration is often seen as unavoidable as environmental degradation, particularly with regard to freshwater resources, leads to an inability for these communities to remain self-sufficient and viable. However, such analyses tend to overlook the strength of attachment communities feel to their homeland, and also the ability of communities to continue to reside in areas where they are more reliant on imported foodstuffs than on what they are able to produce locally. In some respects, it is surprising that the latter point is overlooked as the majority of the world’s population now live in urban as opposed to rural environments and are far from self-sufficient. Clearly, access to drinking water is an essential resource, but the ability to produce food crops is less of an issue if communities have the means to purchase imported food. Smith’s discourse analysis relies on interviews conducted on three main levels within Tuvalu and Kiribati: governmental, civil society groups, and residents. Some of the most basic concerns centred around the notion of being perceived as relatively helpless victims of climate change—“eco-refugees”—both with respect to concern with an oversimplification of the reasons for and patterns of migration, and also as far as the desire to be perceived as capable, valuable members of their own communities—and of any communities they as individuals or groups might move to in future. Educational, economic, and ‘up-skilling’ opportunities can be entirely independent factors in decisions to relocate. [The Prime Minister and the Foreign Minister] drew attention to key words in the discourse beginning with the Earth Summit of 1992 and an emphasis on the ‘vulnerability’ of small island developing states. This was criticized as being a somewhat negative term that implied a lack of agency among these states and a sense of them as being powerless victims. Whilst there is a large amount of truth in these states possessing a relative lack of power and agency, in relation to the major industrialized powers, criticisms of the use of the word ‘vulnerability’ were acknowledged by the UNFCCC signatories. By the turn of the twenty-first century the discourse had shifted to the seemingly more positive use of ‘resilience’ as a key term. Clearly, this did not alter the fundamental power differential between the small island states and the major industrialized powers. Yet both ministers felt that this was a significant turning point in how Tuvalu and other Pacific Islands were not only viewed, but also how they saw themselves in relation to each other and the rest of the world. [Ministers] feared that whereas mitigation was a clear mandate to reduce greenhouse gas emission, adaptation could be interpreted in many different ways. For them, the worst case scenario was for the industrialized powers to continue to produce greenhouse gases but attempt to offset any dissent and protest from states such as Tuvalu by ‘buying them off’ with adaptation aid packages. In the most extreme future scenario this could mean assistance to relocate as the various islands of Tuvalu become increasingly uninhabitable. …individuals and communities would much prefer to maintain the majority of their traditional lifestyles where they currently reside… it would be wrong to think of the outer islands and the main island of Funafuti as wholly separate and distinct communities. Many of those currently residing in Funafuti continue to identify themselves as being from Vaitupu, Nanumea or one of the other outer islands. There is also an informal system of remittances being sent to these communities from family members in Funafuti and those working overseas. Because these transactions are not formally monitored and recorded, the amounts involved are difficult to quantify. With this income stream being available to buy imported food and other goods there is less of a need for the outer-island communities to choose between maintaining their traditional subsistence practices or to relocate to the main island. This issue of external support to encourage these communities to remain where they are is also something that is relevant to the international donor community. For example, one respondent spoke of an inability to leave their parents and grandparents behind if they were to relocate. At first it was assumed these were living relatives, but the graves of three generations of this family were on the relatively small plot of land occupied by this household. This is culturally distinct from many western societies who deal with death in a very different manner and assign relatives’ remains to graveyards some distance from the household. Tuvaluan grave sites – similar to other Polynesian islands such as Samoa – are often immediately next to living areas and it is common to see items of food, drink or other memorial artefacts left on graves in remembrance of deceased family members. Several respondents referred to visiting and speaking with ancestors when they were having difficulties and were in need of advice and guidance. The broad tensions are imagined, by Smith, as “pull factors” that lead citizens to envision their futures on the islands (attachment to family, land, way of life) versus “push factors” that cause residents to leave (increasing difficulties of sustainability caused by rising sea levels, but also desires for greater educational and economic opportunities that can be “pulled” back to the islands). 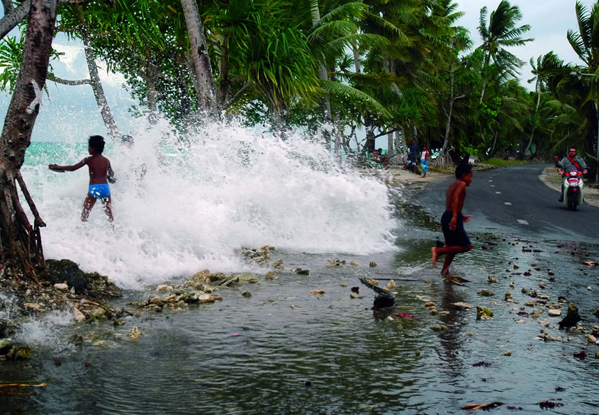 He emphasises that it while the “push” of global warming has been a simplified focus of the dominant global discourse about the fate of the Tuvalu and Kiribati, the reality of their residents’ attitudes and options is far more nuanced and complicated. By highlighting the disjunction between the dominant international discourse on climate change and how this issue is perceived and experienced within Tuvalu and Kiribati, this work raises fundamental questions regarding the implications of the ‘single story’ of these islands. By placing the islanders at the centre of this analysis a more complex, holistic story has emerged. The dominant discourse is only a partial story. This risks leading to a partial understanding, a partial analysis, a partial diagnosis and the offering of partial solutions. The single story may be more straightforward to understand and communicate via mainstream media channels. If the single story is flawed then the challenges of climate change, and other relevant factors, will not be successfully addressed. To address these challenges requires engagement with the communities most impacted and to fully integrate their views into future policies. The full article is available online at Ingenta. This peer reviewed publication will focus on the range of issues and subjects which are relevant to New Zealand and Pacific Studies, with a priority for the latter given to Polynesia and the South Pacific. Disciplines covered will include the humanities and the social sciences and subjects such as cultural studies, history, literature, film, anthropology, politics, and sociology. Each issue of this publication will aim to establish a balance between papers on New Zealand and papers on the South Pacific, with a reports and book reviews section included. The journal is sponsored by the New Zealand Studies Association and is replacing the key publication, NZSA Bulletin of New Zealand Studies.